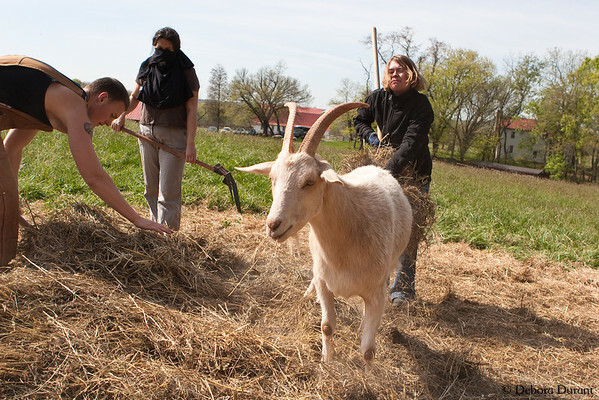 Last Saturday we had a big group of Veg Society of DC volunteers at the sanctuary. I think it was more than 20. It was a lot! They were split up into several smaller groups, which made it much more manageable. It’s harder than you’d think to organize large groups of new people into getting work done! 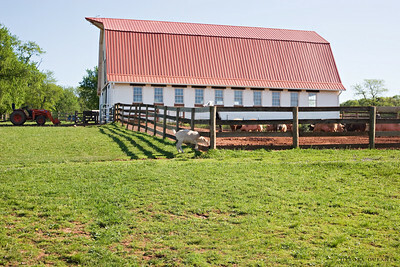 The group that worked in the same area as I was in were people, based on overheard conversations, who had either never been to the sanctuary before, or had been a time or two at events. It’s always nice to introduce people to the sanctuary. Since we had so many people, we were able to tackle some of the big projects that take more time than we usually have during a regular weekend day. 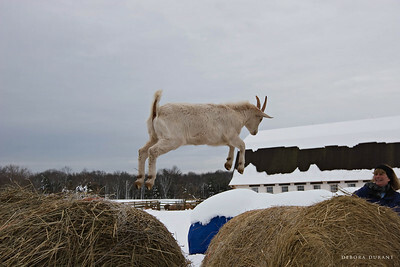 The big hay pile at the top of the goat yard needed to be removed now that winter has passed. It took several loads in the spreader before we had gotten rid of the pile. In between we’d wait while Terry emptied the spreader in a nearby field. It was a gorgeous day – sunny and in the 70’s – pretty much perfect weather for both the helpers and the residents. 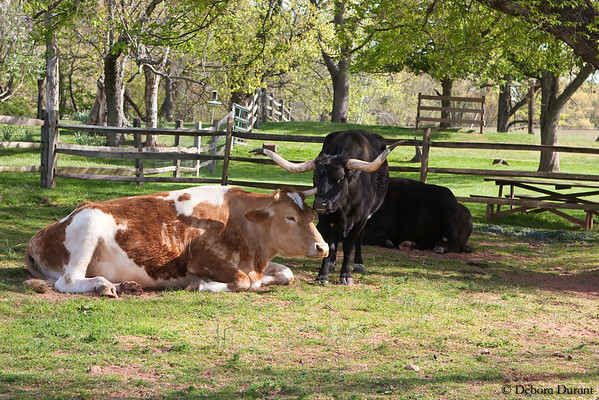 Mini Moo was cracking me up – he was very casually scratching his chin on Carlyle’s horn. Not something I have ever seen before! And Carlye just looks as relaxed as can be. Mini Moo scratching his neck on Carlyle's horn. 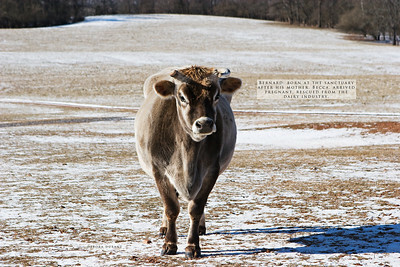 Carlyle is one of the few male dairy cows at the sanctuary. 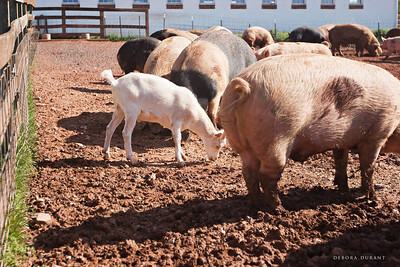 Two new residents arrived at the sanctuary last week: a pig and a goat who are best friends. They are very sweet. 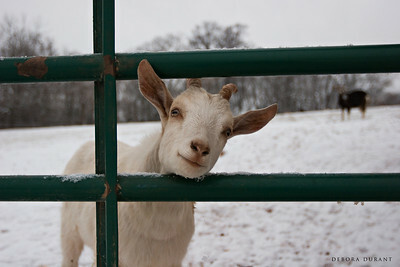 The goat is a bit more cautious before he approaches, but once he’s had a chance to observe you, he’ll come right up and ask for treats. "I was hoping for a treat...."
We finally had a Saturday with absolutely gorgeous weather. The only bummer, for me, was that I had to leave early. Even that was kind of cool, because I was leaving early to head up to the first ever Baltimore VegFest to table for the sanctuary. Tabling for an animal sanctuary at a vegfest is pretty fun. Lots of people stop to talk and I saw bunches of old and new friends. At the sanctuary, though, there were lots of hijinks! 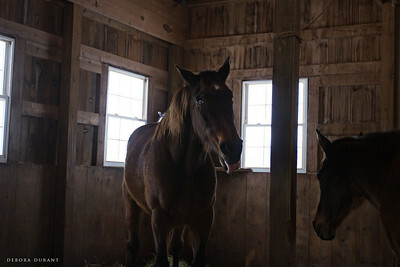 I also took a picture through one of the horse barn windows into the horse barn, and had no idea until I got home that I captured a classic picture of Tally sticking her tongue out at me. Was it something I said? And then! I realized, also not until I got home, that when I was taking pictures of Dexter (while trying not to get nibbled) he also stuck his tongue out at me! I think it’s clear why getting up early on Saturday mornings to pick up poo is such a draw! Spring is (hopefully) on its way! I was sick of winter by mid-December. It’s now the beginning of February, and I’m starting to feel desperate. Thankfully I will be escaping to Florida for a long weekend in just over a week, where I will get to hang out with Baby Sky and hopefully see some sun. Winters in this area aren’t usually too horrible, though I’d choose a Hawaiian winter any day of the week. Usually, though, we have cold days and then warmish days, so it’s not too oppressive. 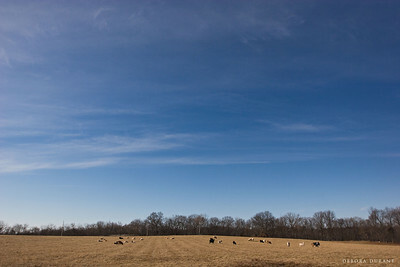 We had hope early on that it would be a mild winter when we had a day in the 70’s for the Thanksgiving For the Turkeys. Unfortunately mild is not a word that can be applied to the winter this year. We had a December that was at least 5 degrees colder than normal (I think we saw 40 only twice), and a January that continued the trend. At least we haven’t gotten gigantic snows like we got last year, and like the rest of the country seems to be getting this year! 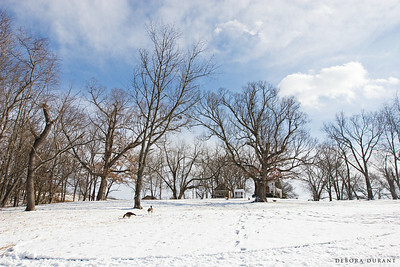 We did get some snow last week, enough to coat the sanctuary in a white blanket. 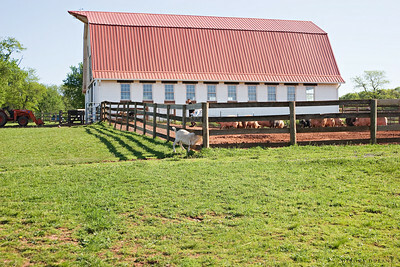 The sheep and goats had been spending a lot of time hanging around the barn, and we tried to bribe them to go up to the hay feeder on top of the hill, but they’d follow us up there, and then follow us back down! Jeremy did not help things by standing in the middle, intimidating the other goats and sheep. And to think he was such a sweetheart as a baby! 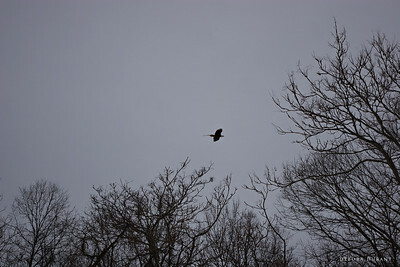 While we were up there we saw one of the Bald Eagles flying to their nest holding onto some nest-making material. They re-use the same nest year after year, and it seems like the nest should be a three story condo by now. In the early summer when the sheep are sheared, the eagles will take a lot of the wool from the compost pile and use it for their nest! We can see the nest from the top of the hill in the goat and sheep yard, but we don’t approach it, especially at this time of year. I believe February is when they lay their eggs in this area, and if they were disturbed they could abandon the nest, which would be a very sad thing. There are a few huge round bales of hay hanging out near the pig barn, and Malcolm was having a great time climbing up and jumping from bale to bale. This picture makes me laugh, because it doesn’t even look real. It looks like he is levitating instead of jumping! The tractor had some serious bling to deal with the snow. I’m really glad I don’t have to drive the tractor. When the ground isn’t slippery they have a donated SUV that they use to tow the spreader, which means they are not only warmer while spreading all the goodies we collect, they are protected from flying turds. 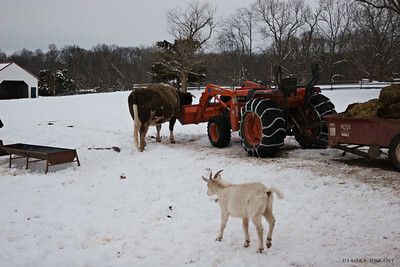 But using the tractor to tow the spreader is better than not using the spreader at all, which we learned last year when the area had gotten several feet of snow several times, and the buckets had to be dumped in these giant piles instead of being spread out in the far pasture. Add some bling to the tractor, and it heads right up the snowy hill! Still trying to get that certain expression on Darcy’s face. Not even close this week, but I like the consolation prize! Last Saturday was a very cold day at Poplar Spring, topping out at about 20 degrees. Frozen water pumps, too cold to scrub the chickens’ perches, too cold to linger in any one place for long. At least it was dry, and there was no wind! 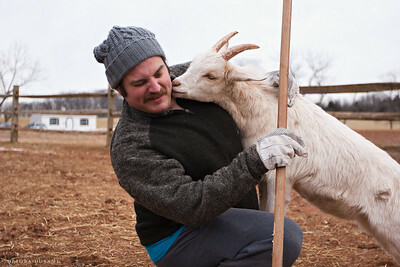 Marius was in rare form in the goat yard. He must have been neutered older than the others, because he exhibits significantly more male behavior. 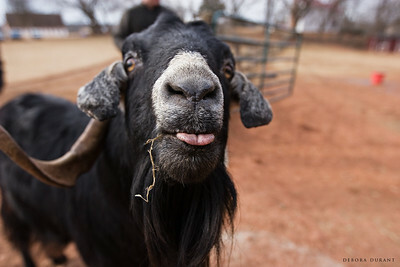 If any of the female goats are in heat, you know who because Marius is right there with her, acting in his own odd way. 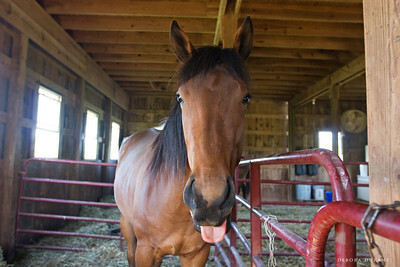 In the flehmen response, animals draw back their lips in a manner that makes them appear to be “grimacing” or “smirking”. The action, which is adopted when examining scents left by other animals either of the same species or of prey, helps expose the vomeronasal organ and draws scent molecules back toward it. This behavior allows animals to detect scents, for example from urine, of other members of their species or clues to the presence of prey. 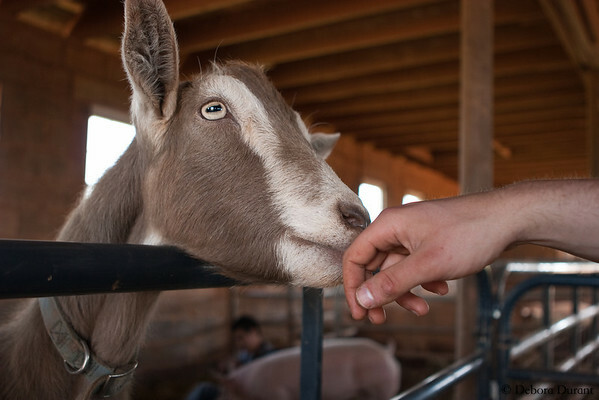 Flehming allows the animals to determine several factors, including the presence or absence of estrus, the physiological state of the animal, and how long ago the animal passed by. It seems likely to me that the tongue waggle is related in some way, if only because it’s part of Marius’ behavior around females who are in heat. I’ll have to ask Jonathan if he knows anything about it. There is something about Darcy. I like to think that I don’t have favorites, but Darcy does touch my heart in a different way. 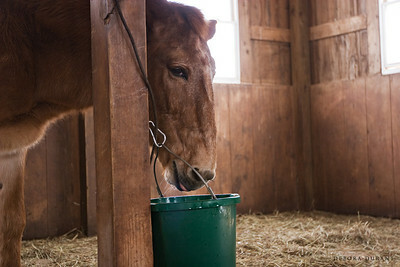 I think it is because he is blind, and because despite being blind, he just keeps on doing his horse thing. It isn’t always easy for him – he has adapted, and quite well, but he has adapted because he keeps trying, even though he gets separated sometimes, and bumps into things sometimes. When I think about the difference between him and Emily, a young cow who was born blind and who retains a stubborn independence and often chooses to be apart from the herd, I think that Darcy’s blindness is a challenge for him that it just isn’t for Emily. He has a certain expression that I love, and which I haven’t quite gotten on camera yet…I keep trying. Someday, maybe. Malcolm is still a complete sweetheart, as you can see! 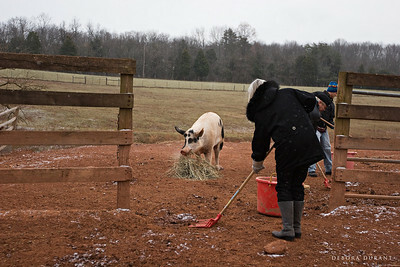 We hustled during chores, partially because it was cold, and partially because we were having a feast afterward. It was Sheryl‘s and Ben’s birthday weekend, so we had a little birthdaypalooza. Sheryl did most of the cooking, of course, with BBQ seitan, pasta salad, french onion dip and veggies, chocolate cake with a fancy cherry filling (or layer? ), and (my contributions) whiskey chocolate and orange chocolate chunk cookies. There was more food than that, actually, I just can’t remember it all! 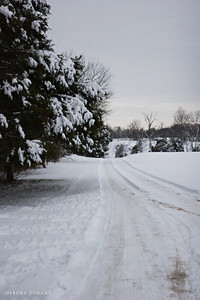 Yesterday morning produced a half inch of snow – just enough for pretty pictures at the sanctuary without much of an impact on the roads. 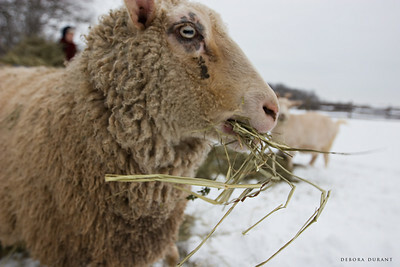 Most of the animals are just fine with the cold winter weather. 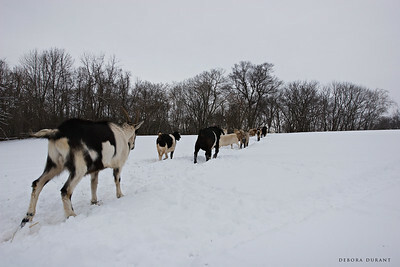 The older and very young individuals need a little extra help – the goats who need them get winter coats, the pigs who need them get heat lamps and of course have lots of hay to snuggle under – and the birds don’t want anything to do with the snow on the ground and are happy for the heat lamps over their perches, but the cows and sheep and horses and mules all seem to enjoy it when it’s a bit colder out. A sweetheart. Still independent in the way of goats, and with a youngster’s exuberance he’s likely to be jumping into the wheelbarrow as we work, or climbing on top of the pigs as they sleep, or getting into the empty-but-for-some-crumbs feeding devices for the cows. Trouble of a sort! 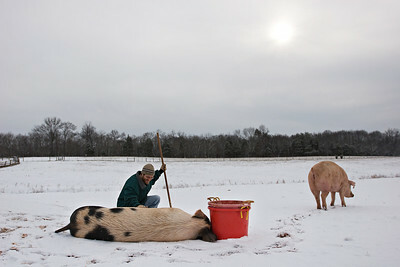 In the pig yard, Petey convinced Ryan to give him a belly rub. 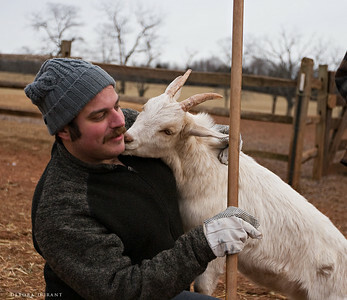 He started out by coming to stand right next to Ryan, and when getting in between Ryan’s rake and bucket worked to get Ryan to pet him, he started stretching until he finally flopped over onto his side for a belly rub. The snow didn’t seem to bother him at all! Or maybe belly rubs are just that much more important. They can act like dogs, for certain. I think that every domesticated animal “acts like a dog” in some ways – that is, their dependence on humans encourages certain behaviors. They’ll beg for treats, and even do tricks of a sort. They’ll ask for attention. Of course they are like dogs in other ways too – they are able to feel pain and pleasure, suffering and joy. They don’t have to be lap dogs for us to not hurt them, to let them live free of harm, free of exploitation. 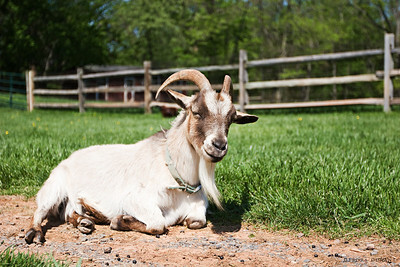 Gloria is an example of an animal who is not typically killed for food, but who is exploited just the same. 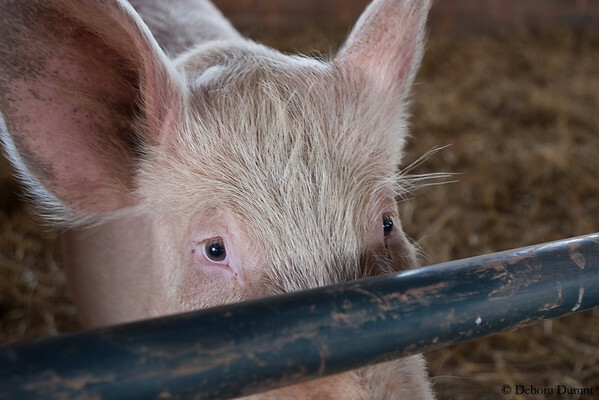 She, and her companion Hal, were rescued from a petting zoo type operation, where they were often punished by tying their heads to their feet. Yesterday Glora was sticking her tongue out at us, but mostly she does like people. This is surprising considering the abuse she received at the hands of her former owner, but at the same time, I see it as a symptom of domestication. Even when abused, even if they do end up fearful of humans, they are still dependent on us. Darcy continues to do quite well adapting to his blindness. Tally still wears a halter with a bell, and most of the time Darcy sticks quite close to her. Once in a while he gets separated from her. Sometimes this happens right after they’re let out of the horse barn, and when I’m there I am usually the one to lead Darcy to Tally. Last weekend was one of those times. I am touched by the trust it takes for a blind horse to be led along by a human. There is often some hesitation along the way, but once we get close to Tally he relaxes and then sticks to her like velcro. 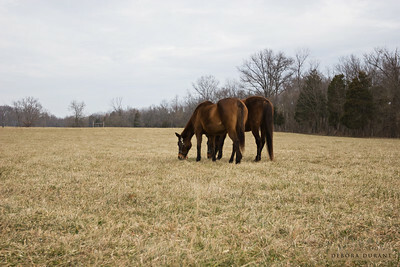 They were both racehorses, both were rescued from auction where they would have been sold for horsemeat. 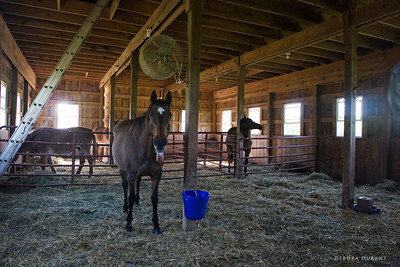 Hearing this tends to shock people, because in this country horses aren’t food. Horse slaughterhouses were shut down based on the delicate sensibilities of meat-eaters, and there is some sense of violation on their part when they learn that horses are instead shipped to other countries to be slaughtered instead. Yet these same people will continue to eat beef, which leads to wild horses being rounded up and killed to make room for cattle to graze. 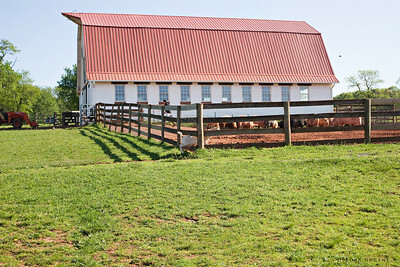 Apparently it is one thing to prevent others from sending horses to slaughterhouses, but something else entirely to change their own behavior. The bunnies weren’t much bothered by the cold either. 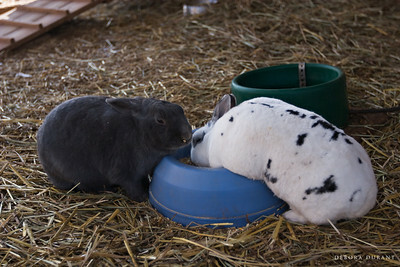 Elton and Twinkle were pretty much in the food bowl as they ate. 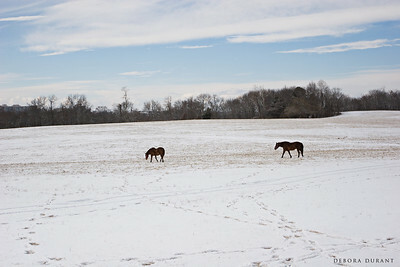 Usually they are napping when we get down there, but the cold seems to invigorate them a bit. 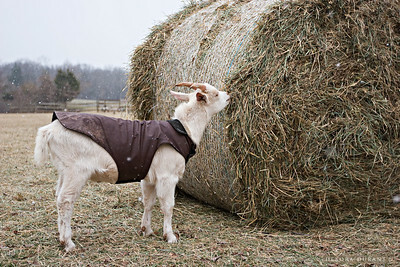 They’ve got some pretty serious winter coats. All proceeds will be donated to the sanctuary. This work by Debora Durant is licensed under a Creative Commons Attribution-Noncommercial-No Derivative Works 3.0 United States License.